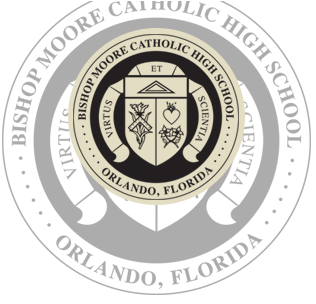 Bishop Moore Catholic High School has a rich legacy of faith. Dating back to the mid-1800s and the inception of the Catholic church in Florida, our first bishop, John Moore, advocated for quality in both education and doctrine. Since our founding in 1954, BMC has endeavored to build on the foundation of faith he left us by serving the families of our community with excellence and compassion. Born in 1835 in Ireland, John Moore immigrated to the United States as a teen. John settled in South Carolina with his sister, where he enrolled in seminary and earned a doctorate degree in theology. After being ordained in Rome in 1860, Father John served in the Diocese of Charleston before being elected the second Bishop of the Diocese of Saint Augustine in Florida. 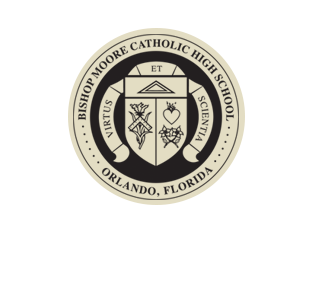 While in Florida, Bishop Moore purchased land for the first three Catholic churches in the Orlando area. He spent much of his time caring for the sick and recruiting priests and parishioners to grow the newly founded Florida church. The Sisters of Saint Joseph are a congregation of religious women who work to alleviate conditions that cause poverty, suffering, and oppression in our community. Since 1954, the Sisters have supported BMC through staffing and volunteerism. The Eucharist is "the source and summit of the Christian life" (Catechism of the Catholic Church 1324). As such, Christian spirituality flows from the Eucharist as light streams from the sun. We need its Light to grow; it is our nourishment and strength. The Eucharist is the summit to which our actions are directed. In the Eucharist, Christ is ever-present, continually giving Himself to us. We, in return, come to Christ, presenting our lives as a gift on His altar. One way we do that is through serving in the liturgy and our community. For more information or to get involved, please contact our Campus Ministry office. Faith is an integral part of who we are and what we do. Our faith is a two-way street leading us from the Eucharist, out into the world of daily life, and then back home to the Eucharist after serving in the world. As a Catholic school, the celebration of the Eucharist is at the center of our Catholic identity. From this source and summit flows our life of prayer, learning, and service. It is critical that our students, their families, and our staff participate in the liturgy within their own parishes on Sundays and holy days of obligation. To find local parishes and mass times, visit our diocese’s website.